Clicking photos make your trips memorable and is certainly the best way to preserve precious moments. Now with the selfie, people tend to click more photos than ever. After clicking photos, you transfer them to your PC. But they often gets mixed up with other photos making them impossible to find when needed. Don’t even bother trying to sort them manually as it could take from hours to days, depending on the number of photos on your system. Hence it is definitely worthwhile to take help of a photo organizer software. What Is A Photo Organizing Software? A image organizing tool is a software which works to manage your digital images. The software to organize photos works to enhance the user’s workflow by managing huge number of images. The software could also have editing features that means, you can crop, edit and make other changes to the images. There are hundreds of software available in the market that claim to organize your photo library, but a few have been proven to be worth. So to save your from all the trouble, here is the list of the best free photo organizer software for Windows to organize digital pictures. Photo Organizer is one of the best software to organize digital photos on Windows as it helps you in streamlining your photo library by organizing in it at a single place. This picture organizer you rename the images in a batch which frees you from the hassle of renaming each and every file. It scans and removes duplicate files to recover the space on your hard drive. It makes it easy for you to find an image as it arranges the images according to the EXIF( you can find photos by the filters like date, name etc). One of the best professional desktop photo organizers, Adobe bridge allows you to access all the files and things you need for a creative project. It helps you to organize and edit things in a batch easily. Moreover, you can add watermarks to your photos. It lets you set color preferences and upload your photos to Adobe Stock. Along with flexible batch processing, you can also organize and keep panorama and HDR images. 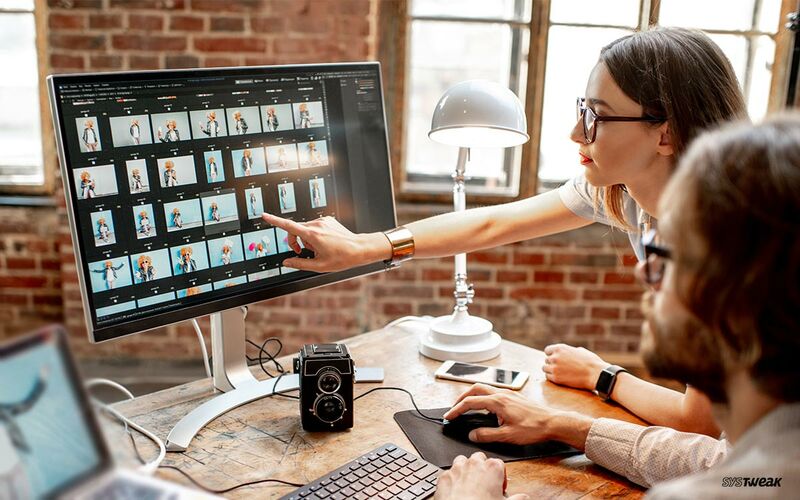 Nikon ViewNX-i is a best program to organize photos on windows with lots of good functions like Photo Tray which lets you store the photos temporarily from different folders, to ease your work while editing and printing images. ViewNX-i amalgamate with Capture NX-D that enables you to make detailed adjustments to still images making them beautiful as ever. You can upload your files to Facebook, YouTube, and Nikon Imaging Space easily via this digital photo album organizer. Magix Photo Manager is a free picture organizer which allows you to directly work on the photos stored on your digicam or mobile phone. The tool not only organizes the photo library but also helps you to scan and remove the duplicate pictures to recover your hard disk’s space. The image organizer comes with preliminary editing tool like cropping, picture optimization, and red eye removal. With the Export option, you can store pictures anywhere you like. Moreover, with the tool, you get a photo manager, with which you can create photo albums. One of the best tool to organize photos, digiKam Photo Manager is an open source application which is good for Linux, Windows, and Mac-OSX. It is an advanced photo management tool which makes importing and organizing digital photos simple and easy. It helps you to edit and view photos from your digital camera. Moreover, you can view and edit Metadata. You can also upload photos to social media. FastStone Image Viewer is a free photo organizer which is a multi purpose tool which is fast, user-friendly image viewer, editor. It lets you convert and edit the images(red eye removal, resize, crop, color adjustments etc). It has a high-quality magnifier with 150+ transitional effects. It supports almost all the formats including, JPEG, JPEG 2000, ICO, PCX, EPS, TIFF, WMF, PSD TGA, PNG, animated GIF, CRW, CR2, DNG, RAF, SR2, SRF, ARW, RW2, ORF, PEF, NEFand MRW. XnViewMP is one of the best picture organizer software which is not only fast and free but also supports more than 500 image formats which makes it so useful. It lets you organize your photo library in different views like thumbnail, full screen, filmstrip. It enables you to rename your images in a batch and it also finds duplicate images. One of the best photo organizers, Pictomio Image Management, is a tool that helps you categorize, organize videos and media files. It works as photo browser, slideshow viewer, and slideshow editor as well. The software is available in multiple languages such as English, French, Chinese, Russian, Japanese, Spanish, and German. It also has Image Manager and EXIF editor. Yet another best photo organizing software, PicaJet Digital Photo Management is a software which lets you import the photos from your camera. The tool has editing tool such as cropping, level adjustment, correct red-eye and image sharpening. You can view images by date, name, keyword, rating or timeline. This customizable tool organizes hundreds and hundreds of your photos in few seconds. It has a feature to add tags, descriptors, Geo tagging to images in a folder. This photo tagging software also has editing features such as crop, rotate, red eye reduction to touch up the image. Who thought organizing your pictures can be fun. With this list of the best free organizer software for Windows 10,8, 7, you get the best way to organize your digital photos. Pick any picture organizing software and start managing your images smartly.